I've noticed that the interior designers on HGTV talk about doing an "install" -- emphasis on the first syllable -- at a job site; in other words, doing the placement and styling of furnishings in a room. 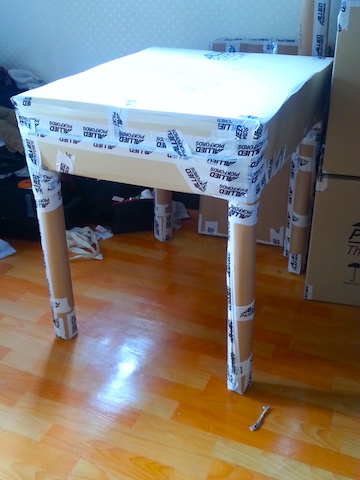 It's the final step of a design project. I've recently completed my own "install." Isn't it funny, by the way, how often verbs become nouns these days? For those just tuning into my little dog-and-pony show here at Lotus & Persimmon, let me get you caught up. 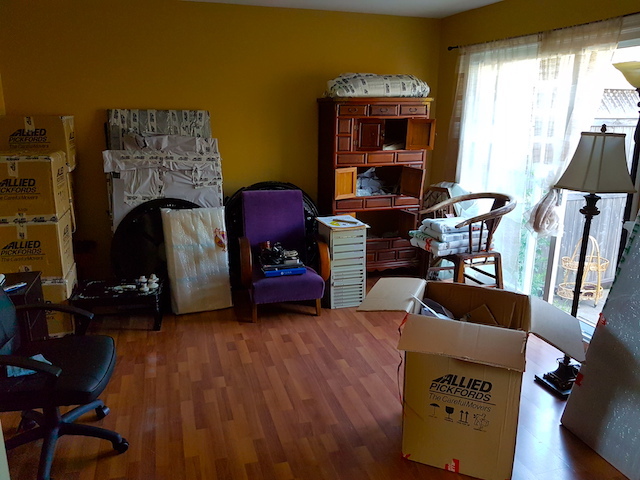 In April of 2016, I left my one bedroom apartment in the rapidly gentrifying neighbourhood of Haebangchon (HBC) in Seoul, Korea, and moved lock, stock and barrel to a small town in Ontario in order to be near an elderly parent. I brought the entire L&P collection with me, or, more accurately, paid a small fortune to have it packed up, stored, and eventually forwarded to me by sea and rail. 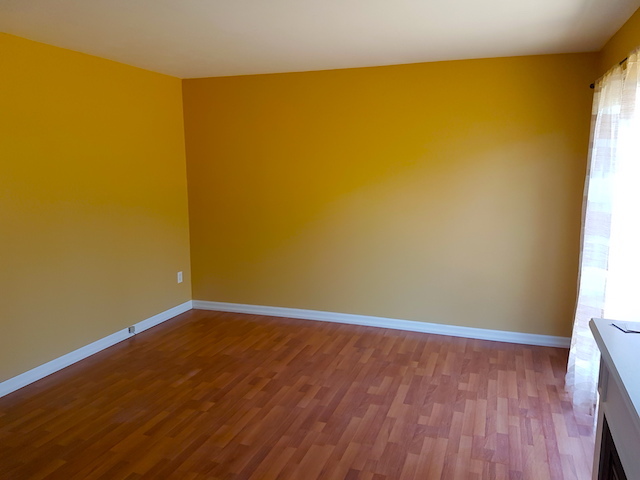 Fortunately, my new living room is bigger. I'm not using it as a living room, however. 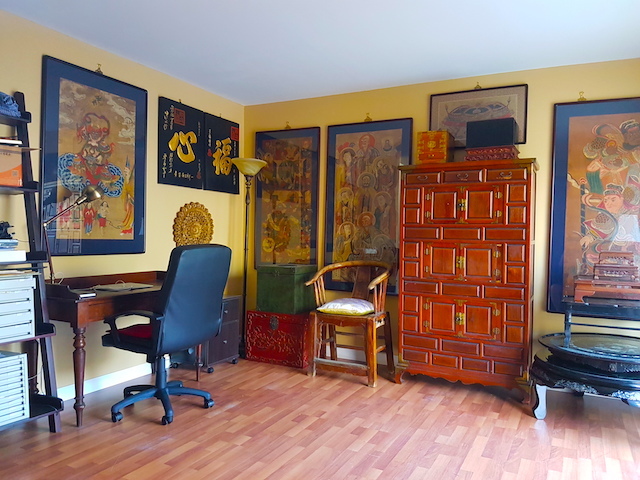 It's my home office and the L&P gallery, from which I write these posts and of which you're going to see many pictures in future. To compensate for the loss of a conventional living room, I've turned the spare bedroom into a sitting room where I read and watch TV, by which I mean Netflix and YouTube. I'll indulge my hunger for vibrant colour in a future house, I guess. My favourite wall colour ever was the imperial Hue purple that I had put on the walls of my Saigon apartment -- I lived in Vietnam's second city for nearly 5 years. 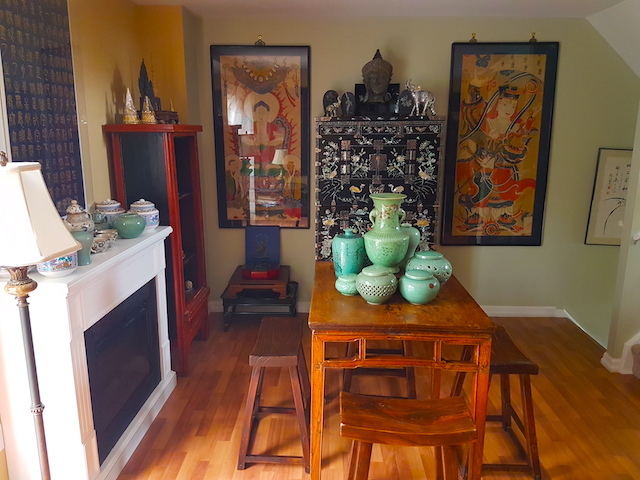 In the meantime, this colour works well as a backdrop for the L&P Buddhist art collection, as I hope you'll agree when you see the final results below. 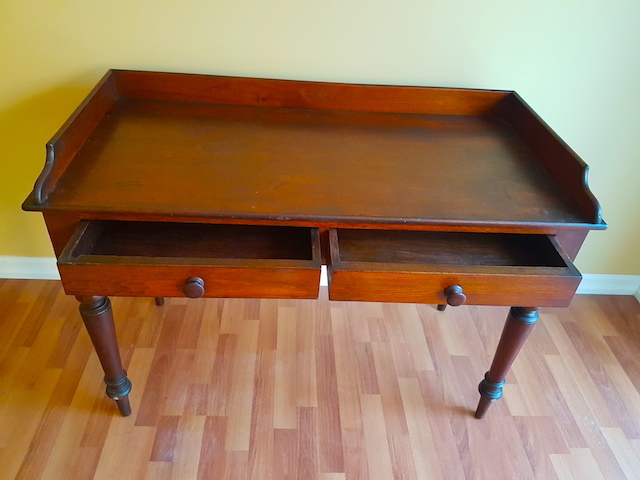 It's a late 19th century desk made right here in Ontario, and it was actually cheaper than a brand new solid wood piece from the big chain stores. I'm now tapping out this post on its surface. It took 6 people 1 day to pack everything up; unsurprisingly, it took me working alone 6 days to unpack everything. Note to those moving east-to-west across the Pacific: buy plug adaptors before you leave. North American stores tend to stock only adaptors for the other direction! Note the new desk at left. Apart from the office chair and the file cart, everything came in the shipment from Seoul. I freely admit that hanging the large pieces was a bit taxing to do by myself. My largest piece is an almost 2-metre-long Korean landscape that I opted to hang in the dining area of the kitchen. I nearly put my back out doing it. There are definitely times that you should ask for help. The table in the foreground is the one that you saw boxed up in a photo above. 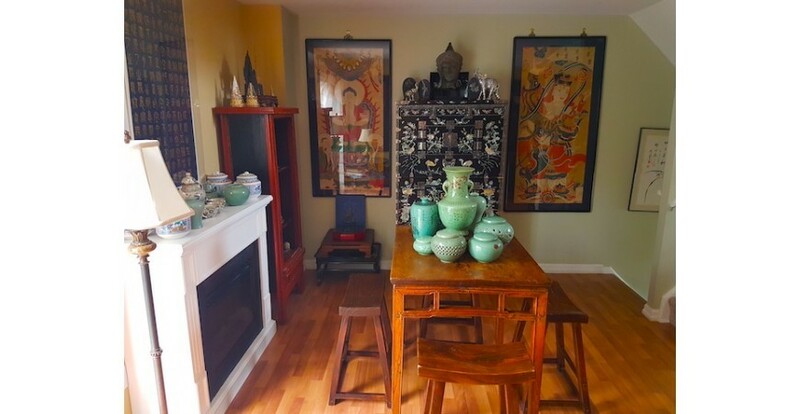 I've since decided to relocate the group of celadon vessels. The table surface is too valuable for other purposes. Buddhism teaches us that nothing is permanent. This "install" is no exception. Eventually, as pieces get sold off -- starting from the launch of official sales on July 4, 2017 -- I will have to re-arrange all these items. For now, though, I'm quite pleased with how my office/gallery has turned out. What do you think? Please let me know in the comments below. L&P visits the Chung Young Yang Embroidery Museum in Seoul. 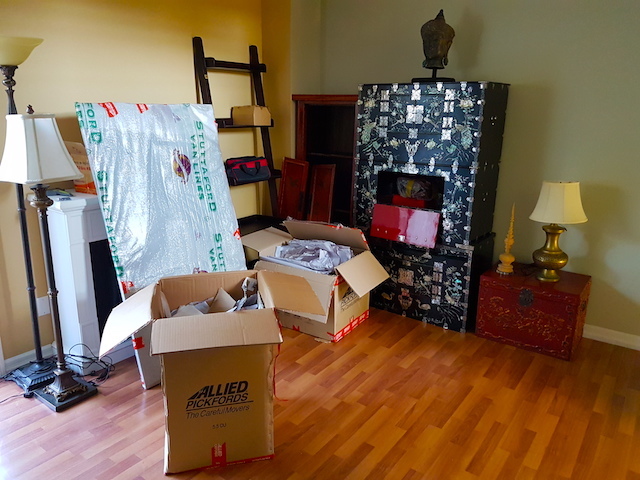 A year ago my flea market finds threatened to overwhelm my living room in Seoul. Where did they all go? L&P visits one of Korea's oldest Catholic cathedrals, Dapdong Cathedral in Incheon. L&P zeroes in on Zaha Hadid's Dongdaemun Design Plaza in Seoul. Christmas is a bigger holiday in Korea than you might think. Throwback: Autumnal scenes from Deoksugung, a palace museum in the heart of Seoul.